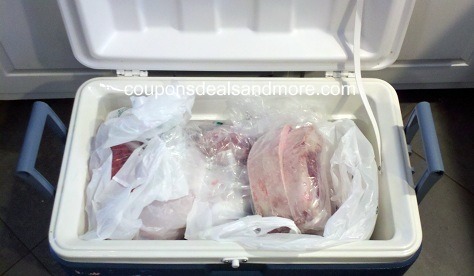 We recently made a trip to the local slaughterhouse and brought back quite a bit of meat. As well as the bags I bought him as a gift! And then he choose what meat he wanted to work with. He uses one steak underneath the other to raise the steak he is currently working on to the correct height. 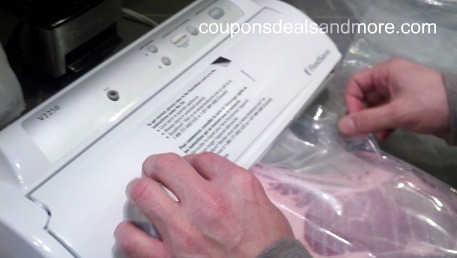 It makes it easier to use your hands to press the button and hold the flap to the foodsaver. 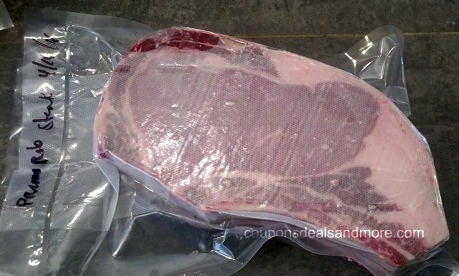 The steak is labeled with date and type and now ready for the freezer. 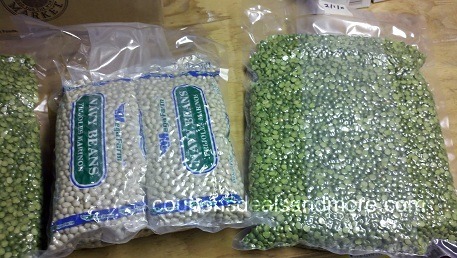 The flour, lard and butter we keep in the freezer, the beans and peas in the stockpile. 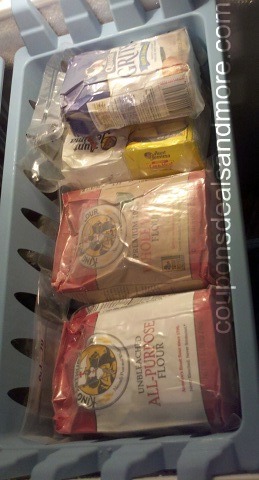 Since I hate the thought of bugs, I definitely am onboard with this habit of hubby’s! 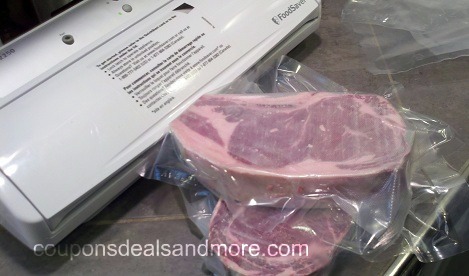 Are you a vacuum sealer devotee like my hubby? 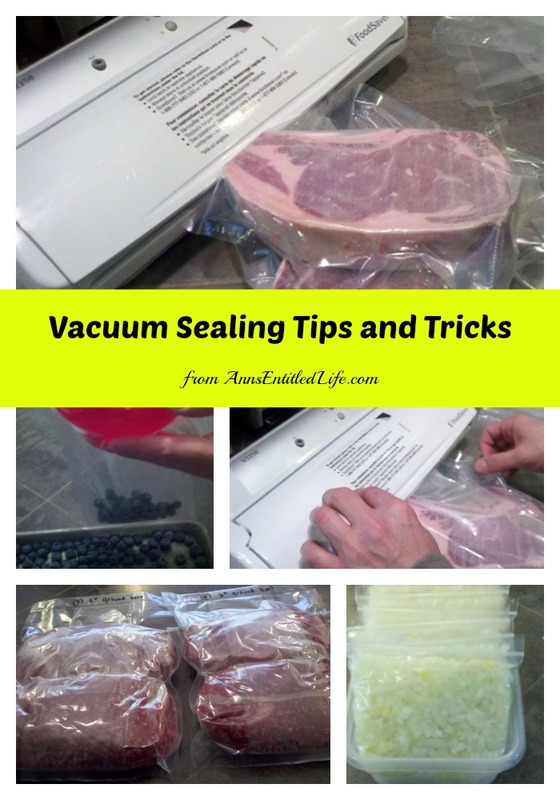 What unique ideas do you have for vacuum sealing? This is really just a small sampling of my reusable bag collection. I stopped counting at 100. Yes, I have a problem. 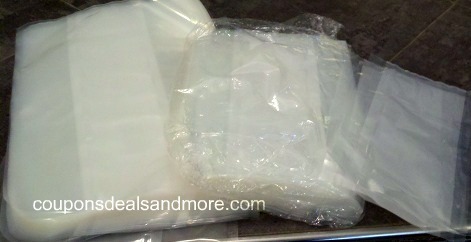 These are some of the cold pack bags we have. That Scout by Bungalow bag is awesome! Inside the vehicle I fold up the bags and place them inside a larger bag. 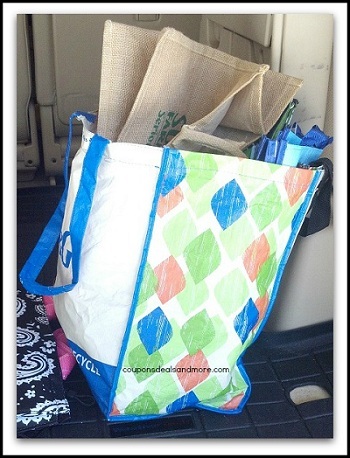 Unless I plan a large shopping expedition, there is only one bag like this in the vehicle. Hubby’s vehicles also have similar bags. 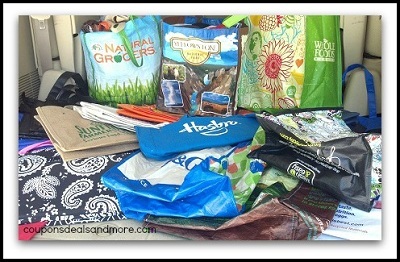 Sonny-boy has a bunch of reusable bags, but they are never organized. He is my delivery mule, so the bags just get tossed into his car and I fish them out on occasion. 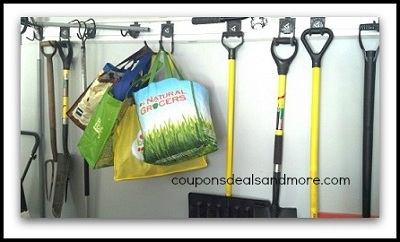 Ultimately, the leftover bags are folded into larger bags and hung on hooks in the garage. That works best for us to know where we can find them. 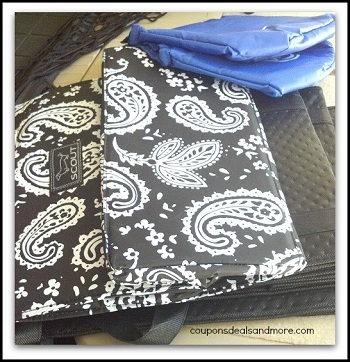 Since hubby uses a lot of these bags to hold things in the basement and in his office, it may be time for me to find a real hiding place! 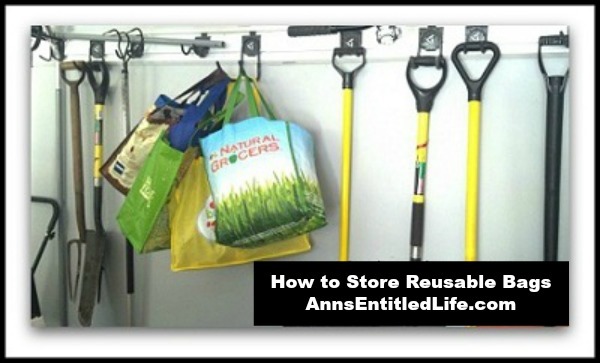 How do you store your reusable bags? I have had multiple cleaning services for well over 10 years now, at home in New York and in our other residences in Utah and Florida. I have learned a lot about the dos and don’ts of hiring a cleaning service, and what to expect once you have hired one. 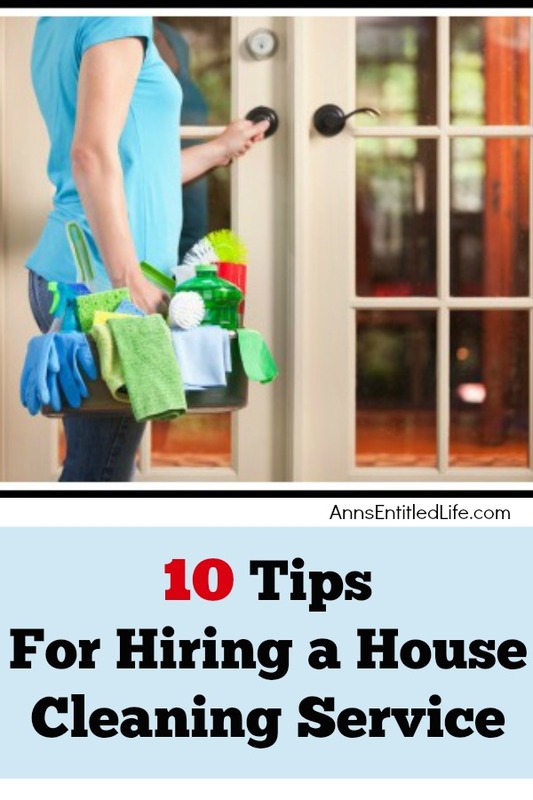 These are my tips on what you should know and consider before hiring someone to clean your home! What you should know and consider before hiring someone to clean your home! • Interview more than one potential service. If you are interviewing individuals, you need to be comfortable with that person (people). If you are hiring from a large company, ask if they will send the same person consistently, or if they rotate staff. There are pros and cons to both: the same person is familiar with your house, but I have noticed the longer the same person cleans for me, the more places that should be cleaned, are missed. The downside to a new crew weekly: there is a learning curve that I am paying for as they familiarize themselves with my home. • Make certain the individual or agency (and their employees) are licensed and insured. If they break something, will it be replaced? Repaired? If someone if hurt in your home, who will pay the medical bills? • Define the scope. Are you looking for a weekly, bi-weekly, monthly or a one-time clean. Make certain that everything you want done, will be done. If the cleaning crew needs to use a stepladder to get to the top shelf and dust, are they willing to do so? Will your furniture and lampshades regularly be vacuumed? What about under cushions? Is cleaning out the refrigerator extra? Are baseboards regularly dusted? Door and window casements? Will the dog-snot be washed from the front door? Are nicknacks dusted? How much to clean a finished-basement? How is the kitchen floor washed? Mop or hands and knees? Ask about OSHA restrictions. I once had a cleaning service tell me it was against OSHA rules for them to use ammonia in my house. • Make sure pricing is explicit! If you are hiring an agency, make certain that there are no hidden fees. If you are hiring an individual, make certain they are paying their taxes and social security. Definitely consult an accountant to make certain you are not hiring that person as an employee, but as an independent contractor. The tax implications for you of one versus the other are great, so make certain your accountant fully explains the ramifications of hiring an individual to you. • Don’t forget to inform the agency/individual of any pets you may have for allergy and phobia considerations. You may think a white rat allowed to roam loose about the house is perfectly normal. The house cleaner may freak and beat Whitey with a broom. The cleaning service may also schedule more time for a dog that sheds copious amounts of fur, may not be willing to change the litter box or the lining of a bird cage. Or, those services may come with an additional cost. • Who supplies the cleaning products? I have steered away from the ultra green companies that will not use a swiffer on my furniture, but would rather spray everything down and wipe away the dust. Regardless of how gentle, I don’t want anything sprayed on my furnishings. 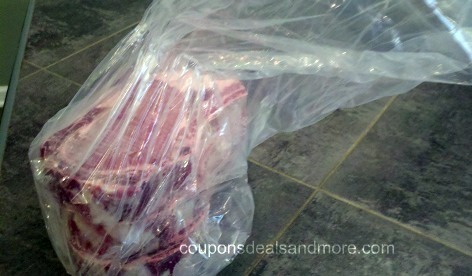 And, while vinegar may be an excellent cleaner, it will destroy my marble floor. 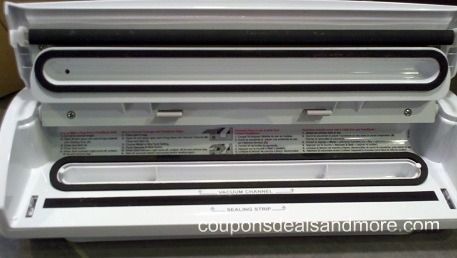 I have found very few products that don’t leave streaks on my stainless steel appliances, so I want to be certain that the cleaning company is happy to use some/all of my products. • Discuss with the service how many people will be coming to your home. You have cleaned your house and know how long (or short) it takes to clean. If it takes 6 hours for you to clean, do not expect a cleaning service to be able to accomplish the same task in 4 man-hours. I prefer one person in my house for every 2 man-hours of labor. I truly do not want a cleaning service here all day, and cleaning is hard work! That means one person will take longer to clean your 6 man-hour house than 3 people at 2 hours each. Fatigue sets in and people slow down. Not only that, but do you really want one house cleaner in your home all day long? • Decide if you need to be home when the cleaning is conducted. Most companies/individuals give an arrival time-frame. Only first service of the day will be “on time”. If you expect a service “between 10 and 12”, and then they clean for the next 2 hours, you need to block out that time to be home. However, if you are willing to give a service a key to your house (or a code if you have coded locks and security system), you are not tied to the house during that time-frame. • Do not clean your house before the cleaning service arrives. Believe me, you will not be the messiest/dirtiest/most disgusting house a seasoned house cleaner has ever seen, especially if they do trash-outs. • Do pick-up and put away the clutter. The more surfaces that are clear of clutter the better the job in the shortest possible time the cleaners can perform. Moving clutter takes time, and some agencies will not do it. I cannot stress the importance of: put away your junk! Also, don’t forget to put away jewelry, prescription medications and cash. Yes, you have checked for licensing and bonding, but better safe than tempted. I have never had a cleaning person snoop or take anything. Ever. But, there is always a first time. 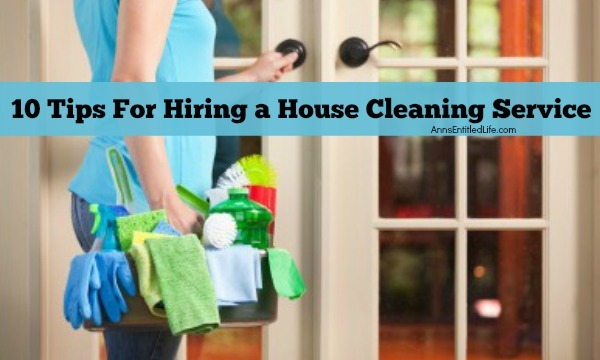 Do you have any tips for hiring a house cleaning service?